300 is shaping up to be one of the greatest films of the year if not ever. Coming off of the success of Sin City, Frank Miller has inspired another soon to be classic. (I hope cuz I see it at the IMAX on Saturday) While on the topic of classics, who remembers Ed Boon and his classic, Mortal Kombat, that started the uproar by parents and congressmen against game violence. I think the YTMND will explain it all. On a side note, I got to meet Frank Miller as his niece attended the same college as me. All I did was say hi, shake his hand, and thank him for making a film that was edgy, actually original, and mostly entertaining. Now when I look back, I am kicking myself for not asking him to sign something. 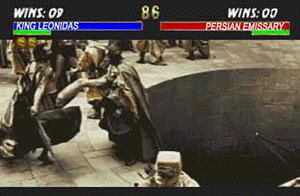 This is 300 MORTAL KOMBAT! Working in conjuction with Central Park Media, which happens to be one of the best anime distributors, is Sputnik7. 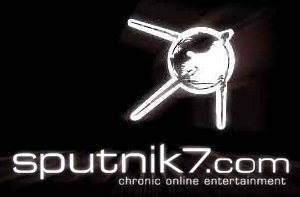 Sputnik7 is a broadcast network that sheds like on indie video, music, film, and anime. Credited as the world’s first real-time audio/video Internet entertainment experience, it brings users into the mix with video on demand and streaming media. I have been a fan of the site since back in high school, getting my fix on various off the wall media. A notable favorite is the music video for Ken Ishii’s Extra; Ken Ishii also went on to provide the music for Rez on the PS2 and Dreamcast. Log on and watch at Sputnik7.